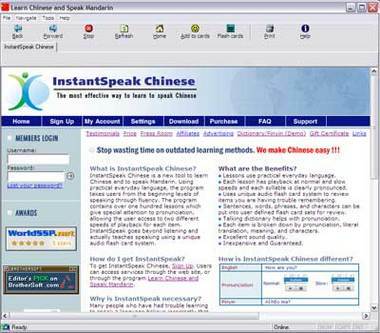 Learn Chinese and Speak Mandarin is a revolutionary and award winning new system for learning Chinese designed by language experts. The program contains personalized lessons that give special attention to everyday language and pronunciation. Users have access to two different speeds of playback for each item. The InstantSpeak method uses a unique audio flash card system that allows you to effortlessly recall what you have learned. Users guide themselves through over one hundred lessons. 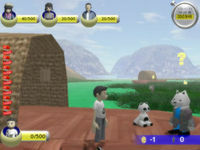 Each lesson contains a real world conversation between two native speakers. Conversations are further broken down into individual sentences which include pronunciation, meaning and the literal translations of the words that make up the sentences. Once the user has gone through a lesson, the items from that lesson can be added to a flash card section of the program for review. Items from all sections can be added to the flash card section for review. Other sections of the program include a 81, 000 entry talking dictionary. 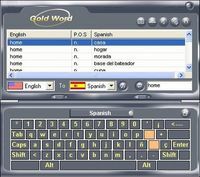 The program contains vocabulary and phrase sections, which together contain over 2500 of the most commonly used vocabulary and phrases. Features: - Lessons use practical everyday language. - Each lesson has playback at normal and slow speeds and each syllable is clearly pronounced. - Uses unique audio flash card system to review items you are having trouble remembering. - Sentences, words, and phrases can be put into user defined flash card sets for review. - Talking dictionary contains over 81, 000 entries and helps with pronunciation. - Each item is broken down by pronunciation, literal translation and meaning. - Excellent sound quality. - Inexpensive and Guaranteed.